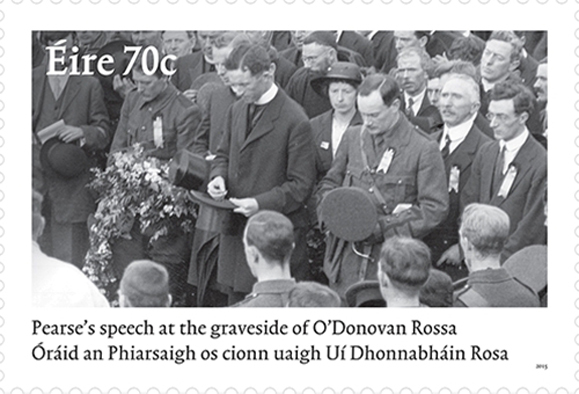 A new stamp by the GPO commemorates the funeral oration of Padraig Pearse. Ireland has released a new 70-cent stamp to commemorate the 100-year anniversary of Pádraig Pearse’s graveside oration at the funeral of Jeremiah O’Donovan Rossa on August 1, 1915. And commemoration services were held in Glasnevin Cemetery, Dublin and Calvary Cemetery, New York. Born in Rosscarbery, Co. Cork, O’Donovan Rossa was a high-profile Fenian and Irish republican. Arrested in 1865, he was sentenced to a life of penal servitude in Australia for organizing a Fenian bid for Irish independence. He and the other prisoners were severely treated, with Rossa being chained with his arms behind his back for 34 days straight. News of the punishment led to a movement seeking amnesty for the prisoners. Eventually released in 1870, Rossa traveled to America along with four other Fenians including John Devoy. He died in Staten Island, New York City, on June 29, 1915, but his body was soon repatriated to Ireland. An enormous crowd followed the funeral cortège to Glasnevin Cemetery, where Pearse’s famous address with its closing lines, “but the fools, the fools, the fools! They have left us our Fenian dead, and while Ireland holds these graves, Ireland unfree shall never be at peace,” was seen in retrospect as a call to arms. It fanned the flames of the short-lived Easter Rising in April of 1916, following which Pearse and 15 other rebel leaders were executed. President Michael D. Higgins led the official state commemoration of the centenary of O’Donovan Rossa’s funeral in Glasnevin. While John Whelpley, Rossa’s great-grandson, who is working on a documentary examining his great-grandfather’s legacy, unveiled the stamp in Rossa’s birthplace in Cork. Taoiseach Enda Kenny described O’Donovan Rossa as “an iconic figure in Irish history,” according to the Irish Examiner. “Even one hundred years after his death his name is synonymous with the Fenians and with Irish nationalism,” Kenny said.